If the Trump administration was looking for distraction from the Barr-Mueller controversy, they found it with Tuesday's announcement by Education Secretary Betsy Devos that she was proposing eliminating the full $17.6 million in federal funding to the Special Olympics. The proposal is part of the Trump administration's planned $8.5 billion, or 12%, in cuts to the Department of Education budget. 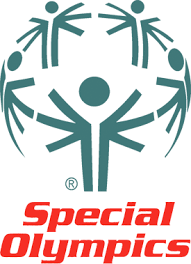 The Special Olympics is the world's largest sports organization for children and adults with intellectual disabilities and physical disabilities, providing daily and year-round trainings and competitions to 5 million athletes and Unified Sports partners in 172 countries. Local, national and regional competitions add up to more than 100,000 events a year. 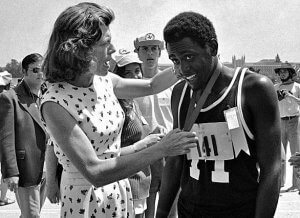 The Special Olympics was started in 1962 by Eunice Kennedy Shriver as a day camp called Camp Shriver to provide children with intellectual and physical disabilities the opportunity to participate in organized athletic events. Shriver was then head of the Joseph P. Kennedy, Jr. Foundation, and one of his nine children. She was also a member of President John F. Kennedy's Panel on Mental Retardation. She attributed her motivation to her personal history with her sister Rosemary, who was born with intellectual disabilities. The effort thrived and today is chaired by Eunice's son, Tim Shriver. Trump's proposed 2020 budget marks the third year that Education Secretary Betsy DeVos has proposed cutting funding for Special Olympics. * 30+ programs serving native Hawaiians, Alaskans and low income communities, as well childhood development and gifted and talented programs. * Federal aide programs including loan forgiveness for people working in the public sector, and, by 50%, funding for work study programs. Most of these cuts primarily effect minorities, the disabled, students and chidren from poor communities. DeVos, however, also proposes adding $5 billion in tax credits for students to attend private schools, titled "Opportunity for Education Freedom." 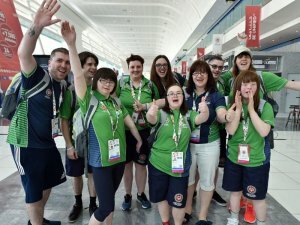 Despite the ongoing appeals, Congress has repeatedly rejected the Trump administration's request to eliminate funding for Special Olympics and, instead, has increased its appropriations, from $12.6 million in 2017 to $15.1 million in 2018 to $17.6 million this year. 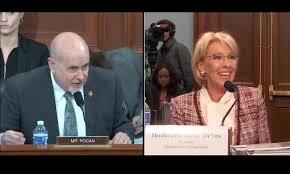 In a hearing Tuesday before the House Appropriations Committee, Congressman Mark Pocan (D-WI) asked DeVox, "Do you know how many kids are going to be affected by that cut?" The education secretary said she didn't know. "I'll answer for you," he replied. "It's 272,000 kids." Just days after her confirmation as Secretary of Education, Devos told a group of special olympians that she was a proud supporter. At the same time DeVos announced she would donate her $199,700 salary to four nonprofits, one of which was the Special Olympics. That has yet to be confirmed.